Mixed-use development at the intersection of Washington and Walnut streets in the heart of Newtonville is under construction. Washington Place will feature 140 residential units with 39,745 square feet of ground-floor retail space. Retail would be set along a pedestrian walkway with outdoor seating and plantings; Washington Place will include over 9,000 square feet of public outdoor space. Residential units will include 17 studios, 80 one-bedrooms and 74 two-bedrooms. 26 apartments would be designated affordable. A one-level underground garage will be constructed for residents at Washington Place with 236 vehicle parking spaces and over 180 bicycle storage spaces. 110 surface parking spaces would be provided for commercial patrons. The Washington Place site is located steps to the Newtonville commuter rail station with service to Downtown Boston. Steps from the Washington Place site, 28 Austin Street (68-unit mixed-use development) was approved for construction on Austin Street in Newtonville in December 2015. Structural Steel framing is going up for the Washington Place project in Newtonville. The project will feature 140 residential units along with over 43,000 square feet of commercial space. Resident amenities will include a roof deck and fitness center along with 15,000 square feet of outdoor space. 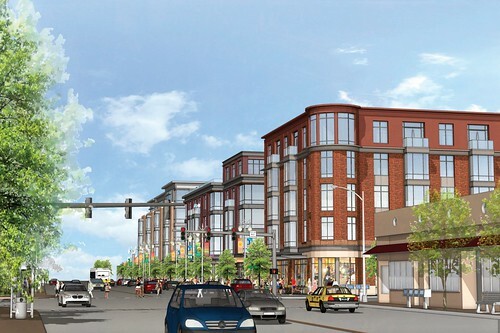 The project is located just steps from the Newtonville Commuter Rail Station. Demolition continues along Washington Street in Newton to make way for Washington Place. The upcoming project in Newtonville, is now set to have 140 residential units, 43,860 square feet of commercial space and 309 parking spaces. Washington Place tenant amenities will include a private fitness center and a rooftop deck. Over 15,000 square feet of outdoor space will be available to both residents and the general public. Mark Development has released new renderings of the proposed 238,075 square foot Washington Place mixed-use development in Newtonville. The latest renderings of Washington Place can be found above. The Washington Place project will construct three five-story buildings with over 9,000 square feet of public outdoor space. A new website, wpnewton.com, has been released for the project.